The original game came out in 1988 and was designed by Sierra On-line. Gold Rush Classic takes you back to the roots of text based gaming as you search your way to your brother and riches. 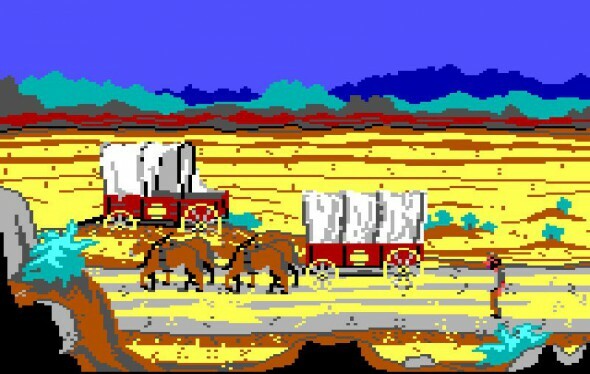 In 1988 Gold Rush was one of the most complicated games of its time. Safe to say… if you haven’t played a text-based adventure this might take some getting used to. Brooklyn: 1848. You are Jerrod, a man who has lost his brother and has waited for over 11 years for any word from his kin. Little do you know, you will receive a sign which will bring forth an exodus and change your life. The time of the gold rush is soon upon you, a time where everyone took to his or her heels to search for their riches in the West. You too must make your way westward, at any cost. The graphics haven’t changed from their ancestor. Colours are limited and sometimes your silhouette will fuse with the background, as the pink of the ground will be the same as your face, or the black the same as your jacket. Funny thing about this is that your eyes turn red when you walk the streets and you face away from the camera, but when you face it directly your eyes are grey and the mouth is red. This was a common ‘issue’ with older games. The lack of a 3D environment might be slightly bothersome. You might misjudge your place on the streets and be run over by a carriage. There are some parts of the streets which aren’t quite bordered off, so you might run into an invisible wall where would seem to be a road. A little unclarity, but then again it’s to be expected from the most complicated game from 1988. There are no voices in the game and the only sounds you’ll hear are when you’ve achieved something and gained points or when you’ve made a mistake, consequently losing points. Since this game is based on it’s predecessor, the creators tried to keep as much of the spirit alive. Text based games are all about finding out what works and what doesn’t. You have to explore every possible thing to discover what yields the result you need. This makes the game extremely satisfying, although it is rather daunting to a newcomer. This game gives no information when you start a game. You begin in the middle of Brooklyn and you are informed of the date. You don’t get information about the fact that you are holding a key to your house, or even that you have one to begin with. 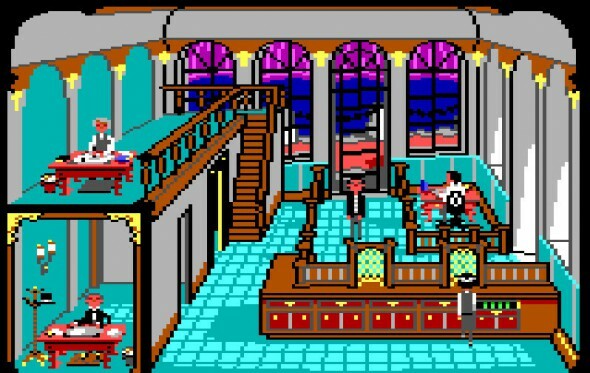 Most games would commence at the homestead, in the familiarity of the place to start off a tutorial, showing you what button does what and what are possibilities. Even if it is just for the first two rooms, it would help a lot of newcomers appreciate the reasoning that’s needed for the game. It goes back to the root of gaming which shows nothing is given and everything gained is an achievement, making the journey more satisfying. There isn’t any information about saving the game, so I had to start all over again everytime the game started. Funny thing is, I still don’t know how to get to the menu. I got run over in my first playthrough, right after losing all my points because I walked on the grass. I needed some help on what to do next, so after looking for some information, I found out how to sell your house. This might seem strange, but is necessary if you want to buy a ticket for a carriage ride. The code to your account is on a transcript in your house.This code changes every single playthrough, though you don’t need the transcript. Should you not have the knowledge on getting in the house like I did, you can bother the bankmanager about your bankaccount number. There’s a lot of things that you don’t know about and a lot goes missing this way. The game isn’t quite suited for the newbies to the genre and appeals more to the text based savvies. A remake of the 1988 Classic, Gold Rush Classic stays true to its origins. Its learning curve is steep and there’s little or no room for error. Without a tutorial, a newcomer to the genre is going to feel lost. If you are into text based games, this will be right up your alley. If you want to try out something new, then be prepared for a new sensation, because this game gives nothing up, and will expect you to dig deep for clues.